These two pages which contain the suras, al-Balad (verses 10–20) and al-Shams (verses 1–6) are taken from a Qur'an written in thick kufic script. The orthographical signs are denoted by single red dots and the tanwin by two vertically arranged red dots in the manner of Abi al-Aswad, (d. AH 61 / AD 681). The use of the colour red to denote all the orthographical signs is a system that was adopted by the Iraqi school of calligraphy, unlike the Andalusian school which used various colours. In the library of the Great Mosque of Kairouan there are Qur'ans displaying both methods of writing, which shows the important linking role that Ifriqiya played as a meeting place between East and West. The tenth verse is marked with a star surrounded by multicoloured lobes. The title of the sura is made up from the name of the sura and the number of verses it contains. It is written in gilt kufic script framed with stippled strap-work reminiscent of the decoration of some of the contemporary bookbinding from Kairouan. The frame has a palm-leaf motif made up of stylised leaves and floral arabesques which extend to the edges of the page. Taken from a Qur'an written in kufic script, these two pages contain two Qur'anic quotations: the suras al-Balad (verses 10–20) and al-Shams (verses 1–6). The use of red for the orthographic symbols is typical of the Iraqi school of calligraphy, while the Andalusian school used a range of colours. Compared with other Qur'ans dating from the middle of the 3rd / 9th century, the kufic lettering style seems more archaic, allowing us to date this Qur'an from the late 2nd to the early 3rd century (8th / 9th century). This is corroborated by the decorations found at the beginning of each sura in this Qur'an, which are mostly geometric and have a more naïve look about them than later Qur'ans. 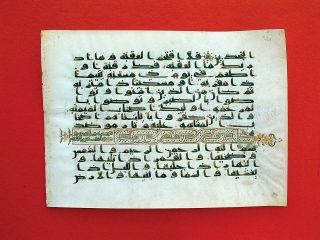 At the time of the abolition of the habus foundation in 1959, this Qur'an was acquired by the Bardo Museum before being transferred to the Museum of Islamic Art at Raqqada in 1983. 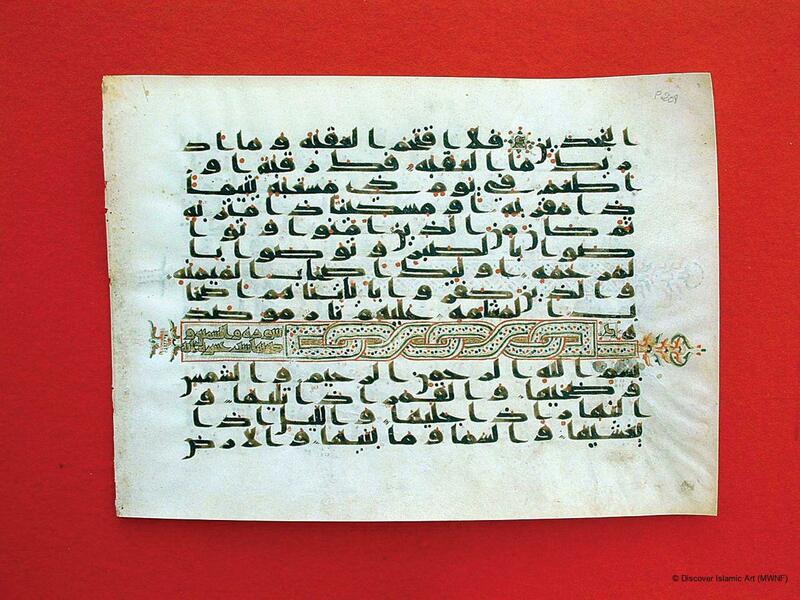 This Qur'an belonged to the old library of the Great Mosque. Given that Kairouan was at that time a great centre of book production it is highly likely that this example was copied and bound at Kairouan on locally tanned parchment. Tunisia: from Christianity to Islam (exhibition catalogue), Lattes, 2001, p.194, plate no. 112. Ifriqiya: Thirteen Centuries of Art and Architecture in Tunisia, pp.159–62, 182–3.